Having a child is expensive no matter what the study you look at. 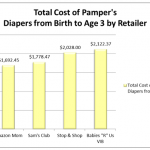 A major expense of course is diapering the child. In recent years strong competition has come from manufacturers, retailers, and dotcoms to acquire the coveted loyalties of new moms. 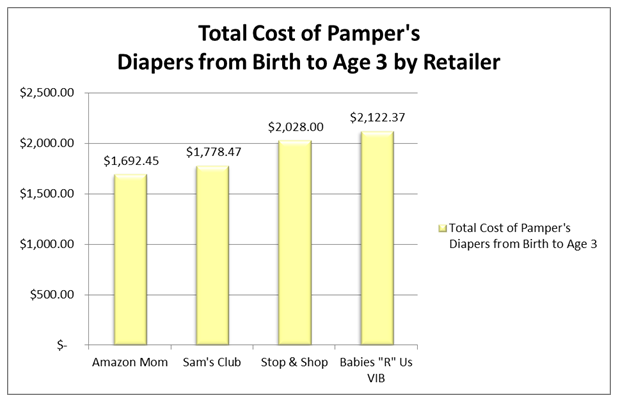 This diaper analysis compares the leading diaper savings retailers/programs: Amazon Mom, Sam’s Club, Stop & Shop, and Babies”R” Us VIB program. 2.5.4 Analyze practices that allow families to maintain economic self-sufficiency. Explain the problem and go over the analysis paper instructions. Take a class poll to see what your students predict (hypothesize) will be the cheapest place to buy diapers. If your a technology friendly classroom, time students to figure out the answer by giving them 3 minutes to search for it online. Depending on how bright your students are or the class level you may want to go over the steps necessary to solve this problem. This is good to do on a SMART board so you can save a copy of the class notes for students to refer to while doing their analysis papers. The project directions specifically ask students to examine Amazon Mom. Other than, Amazon Mom, you don’t have to tell students which companies they should choose to analyze. I may give general overviews of places where people typically buy diapers or ask the class where they think moms buy diapers. Some students may have young siblings or relatives so they may have first hand knowledge of this subject. The other option of course is to tell your students which four retailers* to compare which makes it easier to grade. *The Excel template included with the lesson includes the four retailers I analyzed. Other hints for students: remind students that they should compare apples to apples. You may also want to provide the CDC growth chart (in links below) for students and tell them which percentile to use so the class does the same analysis. Write out the steps necessary to solve this problem as a class. Allow class time for students to start their research. Rubric for analysis paper included in the report instructions below.